Excellent news: Barbaro survived a 6 hour surgery this afternoon and has walked back to his stall under his own power. He is by no means out of the woods, but surviving to this point is pretty damn amazing - most horses with leg injuries this severe never even make it into surgery. This article provides excellent information on the procedure, post-procedure, and the keys for the horse's survival going forward. It basically explains everything better than I ever could, like the fact that if a horse has a bone that is broken into 20 different pieces, and 6 hours later walks back to his stall on his own, then those equine veteranians are total and complete miracle workers. a trainer and a really nice guy. The man on the left is a freaking wizard. Thoroughbred race horses are amazing animals. At distances greater than 1/4 of a mile, they are the fastest animals on Earth. They weigh between 1200 - 1500 pounds and can run in excess of 35 miles per hour, yet their ankles are the same size as yours and mine. That's pretty mindboggling if you think about it for a minute. As strong, muscular, and gallant as they are, they are also extremely fragile animals. 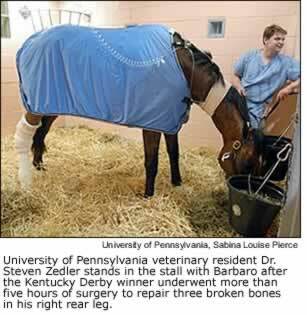 Leg injuries to Thoroughbred race horses are rather common. But horses breaking down is not that common. The most heartbreaking thing about when they do is that unlike humans, they do not stop, but rather they keep on trying to run. I was only 1 year old when the famous filly Ruffian broke down during a nationally televised match race and had to be euthanized. I was not yet into horse racing in 1990 when famous horse Go For Wand broke down in the Breeders Cup Distaff and had to be euthanized. I wasn't really into racing yet in 1993 ( I think I watched the Derby that year and that is all) when Union City broke down during the Preakness and had to be euthanized, and then three weeks later in the Belmont when the Preakness winner Prairie Bayou broke down and had to be euthanized. I was very much into horse racing in 1999 when Charismatic broke down in the stretch run of the Belmont, but his life was saved during a through the night surgery and he survived to live a healthy life. 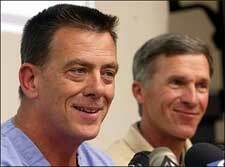 I can only hope that Barbaro does the same. If he does he will become just as famous and beloved as if he had remained healthy and won the Triple Crown. So good to hear. That and the Flaming Lips show in Atlanta last night have us gleaming with optimism this morning. It's the first of many hurdles. I feel that he should be ok. Ruffian hurt herself because she lost her mind not being able to run during recovery. He seems to understand he is in a bit of a spot and that he has to be careful, according to reports. Hello. My husband is a retired tool-maker, both of the old school and modern sophistication design. He envisions Barbaro rehabilitating in something that resembles the back wheels (seen on a dog that has lost the use of his rear legs) that would allow pressure to be taken off both his legs and back, yet still allow good walking movement. I think I know the dog wheel contraption that you are talking about, because I saw a dog walking with it Sunday during Bay To Breakers. It basically suspends the back legs in the air, replaces them with wheels, and the dog walks with it's front legs and the wheels in back. "(Dr.)Sweeney said there are two major concerns in the first days of recovery, the possibility of infection from the surgery and laminitis, a potentially fatal disease sometimes brought on by uneven weight balance." You could probably Google "horse colic" and "horse laminitis" to learn WHY this happens if a horse does not stand and use all of it's legs to distribute it's weight, but to answer your original question it looks like your idea is just not feasible for horses. I would guess this is because horses weigh 1200-1500 pounds whereas dogs weigh 25-100 pounds, so if a horse stops supporting it's weight in a conventional way then it would lead to all kinds of physical & muscular problems supporting that massive weight unevenly.